“The longer I live, the more beautiful life becomes.” This quotes by Frank Lloyd Wright should be the way we feel about getting older. Advance care planning can be an important part of getting older for you and your loved ones. Advance care planning1 is not just about old age. At any age, a medical crisis could leave you too ill to make your own healthcare decisions. Even if you are not sick now, planning for health care in the future is an important step toward making sure you get the medical care you would want, if you are unable to speak for yourself and doctors and family members are making the decisions for you. Many Americans face questions about medical treatment but may not be capable of making those decisions, for example, in an emergency or at the end of life. This article will explain the types of decisions that may need to be made in such cases and questions you can think about now, so you’re prepared later. It can help you think about who you would want to make decisions for you if you can’t make them yourself. It will also discuss ways you can share your wishes with others. Knowing who you want to make decisions on your behalf and how you would decide might take some of the burdens off family and friends. 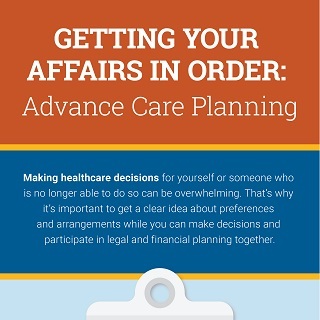 Advance care planning involves learning about the types of decisions that might need to be made, considering those decisions ahead of time, and then letting others know—both your family and your healthcare providers—about your preferences. These preferences are often put into an advance directive, a legal document that goes into effect only if you are incapacitated and unable to speak for yourself. This could be the result of disease or severe injury—no matter how old you are. It helps others know what type of medical care you want. An advance directive also allows you to express your values and desires related to end-of-life care. You might think of it as a living document—one that you can adjust as your situation changes because of new information or a change in your health. 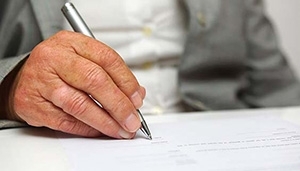 Research shows that advance directives can make a difference and that people who document their preferences in this way are more likely to get the care they prefer at the end of life than people who do not. CPR. Cardiopulmonary resuscitation might restore your heartbeat if your heart stops or is in a life-threatening abnormal rhythm. It involves repeatedly pushing on the chest with force while putting air into the lungs. This force has to be quite strong, and sometimes ribs are broken, or a lung collapses. Electric shocks, known as defibrillation, and medicines might also be used as part of the process. The heart of a young, otherwise healthy person might resume beating normally after CPR. Often, CPR does not succeed in older adults who have multiple chronic illnesses or who are already frail. Ventilator use. Ventilators are machines that help you breathe. A tube connected to the ventilator is put through the throat into the trachea (windpipe), so the machine can force air into the lungs. Putting the tube down the throat is called intubation. Because the tube is uncomfortable, medicines are often used to keep you sedated while on a ventilator. If you are expected to remain on a ventilator for a long time, a doctor may perform a tracheotomy or “trach” (rhymes with “make”). During this bedside surgery, the tube is inserted directly into the trachea through a hole in the neck. For long-term help with breathing, a trach is more comfortable, and sedation is not needed. People using such a breathing tube are not able to speak without special help because exhaled air does not go past their vocal cords. Artificial nutrition and hydration. If you are not able to eat, you may be fed through a feeding tube that is threaded through the nose down to your stomach. If tube feeding is still needed for an extended period, a feeding tube may be surgically inserted directly into your stomach. Hand feeding (sometimes called assisted oral feeding) is an alternative to tube feeding. This approach may have fewer risks, especially for people with dementia. If you are not able to drink, you may be provided with IV fluids. These are delivered through a thin plastic tube inserted into a vein. Artificial nutrition and hydration can be helpful if you are recovering from an illness. However, studies have shown that artificial nutrition toward the end of life does not meaningfully prolong life. Artificial nutrition and hydration may also be harmful if the dying body cannot use the nutrition properly. Comfort care. Comfort care is anything that can be done to soothe you and relieve suffering while staying in line with your wishes. Comfort care includes managing shortness of breath; limiting medical testing; providing spiritual and emotional counseling; and giving medication for pain, anxiety, nausea, or constipation. Learn more about hospice care and other healthcare decisions you may need to make at the end of life. Start by thinking about what kind of treatment you do or do not want in a medical emergency. It might help to talk with your doctor about how your current health conditions might influence your health in the future. For example, what decisions would you or your family face if your high blood pressure leads to a stroke? You can ask your doctor to help you understand and think through your choices before you put them in writing. Medicare or private health insurance may cover advance care planning discussions with your doctor. If you don’t have any medical issues now, your family medical history might be a clue to help you think about the future. Talk with your doctor about decisions that might come up if you develop health problems similar to those of other family members. In considering treatment decisions, your personal values are key. Is your main desire to have the most days of life? Or, would your focus be on the quality of life, as you see it? What if an illness leaves you paralyzed or in a permanent coma, and you need to be on a ventilator? Would you want that? What makes life meaningful to you? If your heart stops or you have trouble breathing, would you want to undergo life-saving measures if it meant that, in the future, you could be well enough to spend time with your family? Would you be content if the emergency leaves you simply able to spend your days listening to books on tape or gazing out the window? But, there are many other scenarios. Here are a few. What would you decide? If a stroke leaves you unable to move and then your heart stops, would you want CPR? What if you were also mentally impaired by a stroke—does your decision change? What if you are in pain at the end of life? Do you want medication to treat the pain, even if it will make you more drowsy and lethargic? What if you are permanently unconscious and then develop pneumonia? Would you want antibiotics and be placed on a ventilator? For some people, staying alive as long as medically possible, or long enough to see an important event like a grandchild’s wedding, is the most important thing. An advance directive can help to make that possible. Others have a clear idea about when they would no longer want to prolong their life. An advance directive can help with that, too. Your decisions about how to handle any of these situations could be different at age 40 than at age 85. Or, they could be different if you have an incurable condition as opposed to being generally healthy. An advance directive allows you to provide instructions for these types of situations and then to change the instructions as you get older or if your viewpoint changes. Jay Harold provides relevant and practical knowledge for your life, your health, and your wealth. ”This post, “Advance Care Planning: 4 Decisions That Could Come Up” is part of that effort to make you a more knowledgeable healthcare person. Please Share it and read more about Jay Harold here. Please take this advice from Muhammad Ali and give back to others. “Service to others is the rent you pay for your room here on earth. Advance Care Planning: 4 Decisions That Could Come Up 5 out of 5 based on 10 ratings. 10 user reviews.